You know that marijuana has gone mainstream when big box retailers like Whole Foods are jumping aboard the gravy train. It was discussed on Thrillist that the reality of the situation is that Whole Foods is “very likely” to start selling marijuana products in the near future as legalization continues to steam roll through the USA on a State by State level. In New York City, there’s already been some banter from bodega owners who are trying to legally sell weed with the legalization in New York right around the corner. They may have some stiff competition if weed buyers across the nation are able to bag their groceries along with a bag of weed! Whole Foods to Sell Marijuana? The CEO of Whole Foods, John Mackey, mentioned during a panel discussion courtesy of the Texas Tribune that there is a “good” chance they will end up stocking marijuana at the popular grocery store owned by Amazon.com. This was preceded by a question about whether they would sell “alternative proteins” such as bugs. Mackey has been vocal about legalizing marijuana in the past. The author of the story, Cailin Hitt, also points out that Whole Food is a high end grocer with steep price points, and she alludes to the fact that marijuana may be cheaper elsewhere. I totally agree with that, even being a loyal Whole Foods customer myself. However, there is a price for convenience, and if you are already there, well hey, may as well get a bag of weed to go along with that garlicky kale salad or fresh chicken soup. The idea of being able to pick up weed there, and smoke it remotely close to the location, if not there, makes sense. People will get high, get the munchies, and spend more. While the CEO didn’t go there, I have to think that’s where his head is at here. Also in the article was a mention that Whole Foods hired a “seasoned trend-spotter.” This is something interesting and something more companies should have. This person made a list of the hottest products to launch in 2019, and as you probably guessed, hemp products were in the top 10 most in-demand. It’s no secret that the cannabis business is booming. We’ve seen some of our most trafficked pages on The420Times be our product review pages that stem from hemp products. The best eye cream we can endorse is made from hemp oil. 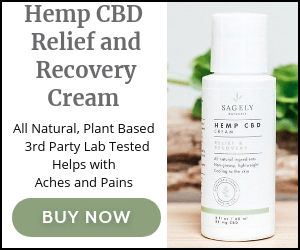 Even pain relievers like Advil have taken a back seat to pain relief rubs with CBD and hemp. We’re in an exciting time, and I’m glad it appears that Whole Foods is embracing marijuana with open arms. With the medical benefits of hemp and CBD, it’s no doubt that this will be fully mainstream in the very near future, and we’ll be hear to let you know who is on board, every step of the way. Thanks Cynthia, I definitely love hearing from readers. Thanks for reading and please come back soon!